In an interview with the After Coal production team, Catherine Moore shared, “I’m one of those who believe that truly understanding how we got to where we are today can better position us to find a way forward.” Moore, a West Virginia native, is producing Cedar Grove, an hour-long radio documentary featuring women’s stories in the staunchly industrial (and often overlooked) Upper Kanawha Valley. While Cedar Grove offers a rich analysis of one valley, it also delivers an invitation for audiences to explore their own relationship to place, industry, and community resilience in the face of uncertainty. Slated for release in 2014, Cedar Grove captures memories of “the good ‘ole days” and visions for the future through contemporary interviews and archival material. The project pulls inspiration from renowned local author Mary Lee Settle, who published five historical novels known collectively as The Beulah Quintet. In her books, Settle traces the history of West Virginia and its inhabitants all the way back to Cromwell’s England and to the late 20th century. Like Settle, Moore’s efforts intend to re-center a community in West Virginia by highlighting the true social and environmental arc of extraction — this time in the realm of non-fiction. 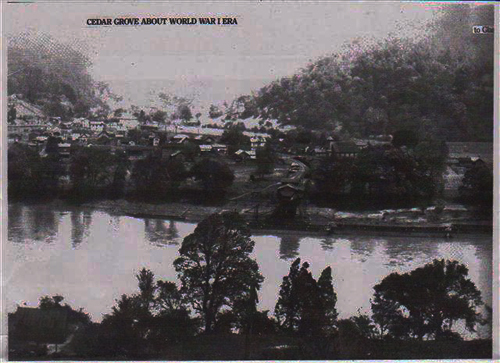 The Kanawha Valley is a fingerprint of Settle’s description, and Moore digs well past the “legends” of history to find explanations for Cedar Grove’s fragile state. Well before coal, the area was building towards its nickname, “Chemical Valley”. Tribal communities extracted salt, and usurpation of the industry by white settlers in the early 1800s witnessed spikes in profit, enslavement, and ship traffic on the Great Kanawha River. Salt extraction overlapped with natural gas discovery and massive timbering. And by the 1850s, when the salt industry began its decline, the stage was set for a coal rush that continued the tradition of exported wealth. For all these reasons, by the early 20th century, the Kanawha Valley was an ideal place to manufacture chemicals. But as mechanized extraction like mountain-top removal mining took hold in the 1970’s, Cedar Grove experienced crippling economic decline. In two swift centuries, layers of exploitation intersected with gradual abandonment from investors. Cedar Grove’s peak, riddled with oppression towards women and African Americans, is still romanticized by many of Moore’s interview subjects. The sentiment about the town resembles, “Well, it used to be this proud, bustling, tight-knit community but now it’s gone to hell in a handbasket and we don’t understand why.” Moore is not shy about offering an honest illustration of the struggling town, but her fascination with and hope towards hyper-local solutions is infectious. Industry and its impacts mark more than the land. They leave an imprint on people. Coal mining isn’t just a thing in West Virginia, it’s a huge part of our identity and it shapes our beliefs about the world. It even changes our very bodies. It gives us food to eat, and in some cases makes us sick. While in agreement with residents about daunting substance abuse issues in Cedar Grove, Moore also uses the words “heartfelt”, “emblematic”, and “palimpsestic” to describe the overlooked valley. Her emotional investment in the Kanawha Valley extends to “all the Cedar Groves all over this state, all over America, and the world”. Through conversations and research, Moore and her team grapple with mammoth questions to the tune of, “How do we resolve this identity crisis–the bipolarity of Mayberry and Mordor–and make sense of such a loss of cohesion? How do we shine a light on what’s beautiful here, what’s worth saving?”. Cedar Grove promises to resemble both a love letter and reflective negotiation, featuring marginalized voices from a community that has absorbed 200 years of industrial exploitation. Moore summarizes, “Like never before, residents are feeling the tension between a deep love of home and the economic, social, and political realities it asks them to trouble through.” This brave production offers a challenge to those living and working in impacted communities: to get attached, to feel ultra-curious, and to continue unveiling the beauty of places once forgotten. Then, perhaps, we can find the literal and figurative way “forward”. 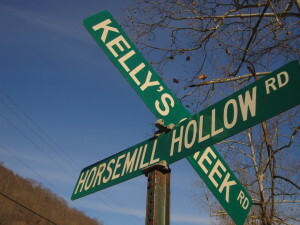 For more information on Cedar Grove and Catherine’s media work, visit www.beautymountainstudio.com. Cedar Grove is made possible through a grant from the West Virginia Humanities Council and the support of the Pocahontas Communications Cooperative.